A man can never have enough screwdrivers, at least I don't think so, but how often do you actually have one on yourself when you need it? 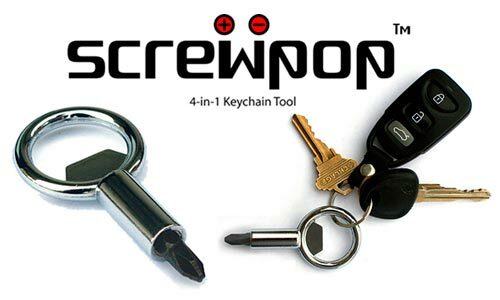 The Screwpop is just what you need to solve your screwdriver-less woes as well as make you the life of the party. It features both a #2 Phillips and a #2 Flat head screwdriver as well as a 1/4 hex nut driver and a party popping bottle opener. At just under $5 bucks, the Screwpop would make a great stocking stuffer, but unfortunately for us the Screwpop is sold out until the new year. If the Screwpop is on your must have list, you can sign up on the Screwpop website to be notified when they become available.